The Women’s High Network Comes Together to Support the Stamford Yerwood Center with a Day of Inspiration, Connection, Food, Art, Music – and Shopping! The event is the first supported by a new convergence of passionate women business leaders, community leaders, and supporters in Connecticut and across the country as a new “center of gravity” forms to support innovation. Hundreds of change makers are gathering today to meet, listen and learn from acclaimed speakers, best-selling authors, humanitarians, successful entrepreneurs and artists building collective energy and raising money for the famous Yerwood Center, an innovative organization serving Stamford’s children and youth since 1934. The Center, which serves hundreds of children each year, and has changed thousands of lives for the better, will benefit – including proceeds from Saks Fifth Avenue shopping (10% of event-related purchases will go directly to the organization, along with donations made through ticket sales and an auction at the event). The event is the first supported by a new convergence of passionate women business leaders, community leaders, and supporters in Connecticut and across the country as a new “center of gravity” forms to support innovation in how organizations can more efficiently collaborate to support good works. The Women’s High NETwork (WHN) is creating its headquarters in the new Stamford Innovation Center and is celebrating their new home as part of the WINGS OF CHANGE event today. The Women’s High NETwork team has established The HERicane Initiative around the potential of women to collaborate, coordinate and create more value with less resources in order to serve the most people in need. HERiccane lunches are the kick off initiative and sponsored by the group every first Wednesday at the Museum of Motherhood with a $20 admission, from Noon to 3 PM. Networking game changers and social media buffs who wish to move their work to the next level are welcome. Any quotes the were represented by Denise Restauri were not her quotes or approved by her words- they were suggestions in a draft to mark a possible quote and by mistake went to print. They comment in no way reflected her opinions or words. Please use this corrected document and delete the 3/29 release. 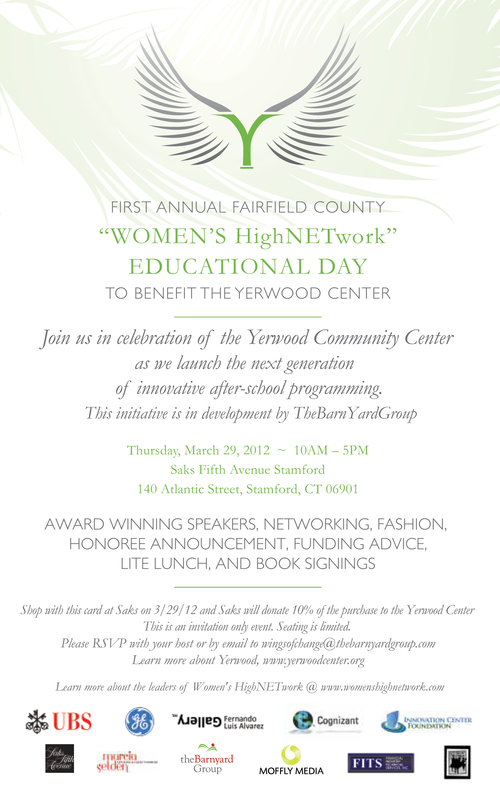 Guests are invited to our first two-part event at Saks Fifth Avenue Stamford to celebrate with The Yerwood Center, the next generation of after school programming. A free educational day for women, featuring acclaimed speakers, bestselling authors, and body-image rock stars, will begin at 10 AM, and an evening star-studded gala will begin at 6 PM. The daytime educational sessions are free, with limited seating. "Wellness After Grief or Illness"
“The Culture of Fashionable Branding and You” by School of Visual Arts Brand and Fashion Guru, Leslie Singer. “The Ground Up Campaign” Moderated by Avis Richards, with Stephen Ritz, Lisa Suriano. “Women Entrepreneurs: ‘I’ Is For Innovation, ‘F’ Is For Funding” Moderated by “85 Broads” Dorothy Price Hill and Patty Meagher, Founder of the StamfordiCenter. Honoring Laurie Meadoff and Dr. Judy Kuriansky who are being given Joyce Yerwood Lifetime Change Maker Awards. Ruma Bose, bestselling author of Mother Theresa, CEO and 2011’s Next-Generation Change Maker in Philanthropy (honored by Perspectives In Philanthropy). Kathy Eldon, admired for her endurance after the tragic murder of her son, Dan Eldon, a Reuters photojournalist killed in Somalia in 1993, acclaimed filmmaker, bestselling author, and inspiring orator; Executive Producer alongside Julia Roberts of “Extraordinary Moms,” a special about the power of mothers to change the world, which aired on the Oprah Winfrey Network on Mother’s Day, 2011. “Entertainment, Women and Diversity” Moderated by UBS Diversity Director and Former Hollywood Executive CiCi Holloway with Colleen Doherty – AVP HR Cognizant NA, Kelly Lebrock, Marta Michaud – Cinematic Management, an iconic name at Wilhelmina. “Empowerment and Diversity” by Author Gina Otto, includes book signing. “Raising Digital Kids by Becoming an Internet Mom” Moderated by CES “Digital Mom” “Raising Digital Kids by Becoming an Internet Mom” Moderated by CES “Digital Mom” Robin Raskin with panelists including Children's Safety Educator Jill Starishevsky (featured on Oprah), Barnyard Group’s Donnetta Campbell, Weber Shandwick’s Mary Jane Walker, and CBS HealthWatch founder Meg Columbia-Walsh. “The Value of a Woman” by Joy Rose, Founder of Museum of Motherhood, NYC. “Your Kids, Diversity and Bullying” by Former ESPC Personality Wayne Soares. Live art performance from contemporary artist Fernando Luis Alvarez which includes a cast of the Connecticut Ballet's dancers and actress Kelly LeBrock (performed in the past for brands such as Chanel, Saks, and Le Meridien hotels). Special Saks' Designer Spring Collection Fashion Show. Tribute to Gene Wilder – Master of Ceremonies and talk show icon Joe Franklin. Performances from Broadway star and acclaimed stage actress Jodi Stevens. Jerry Drake and his 16-piece Front Page Orchestra. Extraordinary edibles and specialty drinks from celebrity caterer Marcia Selden! The Women's High NETwork development group connects profit to non-profit worldwide. Yerwood Center is dedicated to providing youth with educational and personal development opportunities that will empower them to reach their potential and contribute to society. Through programs, camps and after school activities modeled in part after Stamford Board of Education principles and taught by talented educators, the community center enriches hundreds of students daily.